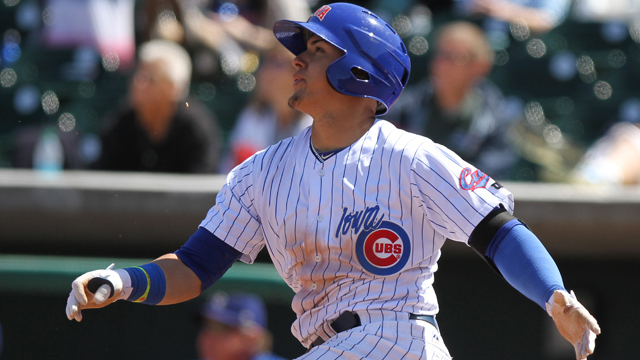 Des Moines, IA - SS Javier Baez was named the Pacific Coast League's Player of the Week for the week of May 19-25. Baez is the first Cubs position player to win this award since Welington Castillo, June 13-19, 2011. Baez hit .400 (12-for-30) with six doubles, while tying for the PCL lead with three homers and eight RBI. The Cubs slugger belted his second career grand slam in the fifth inning of a Cubs' 7-3 win Sunday afternoon. His first was last year on June 18 while playing for single-A Daytona. It was the Cubs' first grand slam since Donnie Murphy hit one last season on June 15. The four RBI Baez had in the game were his season-high, and his six multi-RBI games on year are a team-high. The 21-year-old is on a season-best 10-game hitting streak. He's batting .390 with six doubles, four home runs, 11 RBI, and nine runs scored during the stretch, raising his average from .142 to .211. His streak is the second longest of his career. He also had a 10-game hitting streak from May 14-24, last season with Daytona. His career-best is a 16-game streak from July 14-21, 2012 with single-A Peoria. Baez is batting .211 with seven doubles, one triple, a team-leading seven home runs and 22 RBI in 38 games in his first year at triple-A. He was placed on the disabled list in early April with a sprained left ankle, and missed eight games. Baez is the third consecutive Cub to win a weekly award, and the fourth on the season. LH Tsuyoshi Wada, LH Chris Rusin, and RH Kyle Hendricks have all earned PCL Pitcher of the Week awards this season. Wada was honored for the season's opening extended week of April 3-13, Rusin won for the week of May 5-11 after tossing the PCL's first no-hitter since 2009 and Hendricks earned the award last week. The Cubs wrap up a four-game series with Colorado Springs this afternoon before going on the road to play nine games in eight days against Memphis and Nashville.